← In the News: Emanuel A.M.E., Encyclicals, Etsy, and more! In our global cosmologies, blood is sacred, repulsive, a sign of both salvation and damnation. It is the carrier of life, disease and even personal characteristics, like pride or sophistication or criminal behavior. We are guilty when we have blood on our hands, our feats or failures are in our blood, enemies have bad blood between them. “Blood impresses the imagination,” wrote Dennis J. McCarthy in the Journal of Biblical Literature in 1969. Blood’s attending powers are something we may or may not believe in, but blood is also a medical science. The Jehovah’s Witnesses faith, in particular, has caused both conflict and pioneering advancements in medicine’s use of blood. Jehovah’s Witnesses are broadly (and reductively) known for two things: knocking on your door when you least want or expect it; and refusing blood transfusions that could otherwise save their lives. While the medical technology for transfusions has existed for centuries, and the Jehovah’s Witness faith has too, their conflict is fairly recent. British physician Richard Lower is broadly credited with performing the first successful blood transfusion between two dogs in 1665. 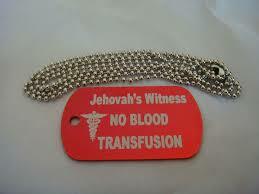 Nearly three hundred years later, in 1945, Jehovah’s Witnesses first stated their opposition to transfusions. Citing various verses in the Bible, including Genesis 9:3-4 (above), Leviticus 17: 10, 12, and others, Witnesses declared that “consuming” blood, either while eating (vegetarianism is part of church doctrine) or via transfusion, is not permissible for believers. However, from the Congregation’s clarification (which focuses on consent) and Petrini’s above concerns (doctors are potentially damned if they do or don’t), it’s clear that refusal of any kind can be a challenge for patients and doctors who have differing ideas of how to proceed with treatment, whether they’re stated or not, whether they’re religious in nature or not: a cancer patient who chooses not to undergo routine and largely effective chemotherapy; a pregnant woman who chooses to carry a terminal fetus to term even though her life will be endangered by doing so; an ALS patient who chooses to stop eating and drinking in order to avoid the end stages of the degenerative disease. The hamstring in all this patient choice, however, is when a patient is not able to give consent (if they are either incompetent or unconscious), or when the patient is a minor or a fetus. Internationally, the courts have intervened in the case of minors, almost uniformly ordering treatment because the child is not yet of the age to make such medical decisions. In the case of fetuses, particularly in the US where politically and socially influential groups perceive a fetus to be a life worthy of protection, courts often override the consent of the pregnant patient. Three primary examples come to mind when you consider conflicts between religion and medicine: abortion, euthanasia, and (strangely, fascinatingly) Jehovah’s Witnesses’ refusal of blood transfusions. Although Jehovah’s Witnesses number only about 8 million worldwide and cases of conflict are rare, their belief that the bible prohibits blood transfusions is a classic media attention-grabber. A number of recent cases highlight this. In the UK in December 2014, a judge was asked to intervene on behalf of a young boy who had received extensive burns and required an infusion of blood for survival. The boy’s parents refused the blood transfusion on religious grounds. “I have no doubt at all that they love their son dearly. I also have no doubt that they object to the receipt by [their son] of a blood transfusion because of their devout beliefs. I hope they will understand why I have reached the decision which I have,” Justice Moylan told The Guardian at the time. Because the child was too young to make his own medical decisions and because his parents were seen as endangering his life, the judge was asked to intervene. In countries with modern medical systems, this tends to be the pattern: caregivers become concerned when Jehovah’s Witnesses refuse treatment for their children and ask the courts to step in. Adults, however, are generally permitted to deny any medical treatment for themselves they wish, and the courts have a long history of jurisprudence that enforces such decision-making. But a case in Australia shows that medical, legal and perhaps social support for patients’ autonomous decision-making can fall apart. Reported in the April 2015 issue of Internal Medicine Journal and picked up by both the Sydney Herald Tribune and The Daily Mail, is an account of a 28 year-old Australian woman who was diagnosed with Leukemia when nearly seven months pregnant. The hospital recommended that she undergo a caesarean section to deliver the fetus and then begin chemotherapy but, because the delivery and cancer treatment would likely have required a blood transfusion, the woman refused on account of her Jehovah’s Witness faith. Their words are a profound reminder that doctors are people too, and not merely representatives of a consensus on general medical ethics. They come to their patients with their own ethics, faiths, prejudices, politics and opinions. Biscoe and Kidson-Gerber state that understanding the root of Jehovah’s Witnesses’ opposition to blood transfusions is helpful to a better relationship between doctor and patient and for a more robust respect for patients’ autonomy. While I grant that this statement is probably true, it’s worth asking if the reason for refusal of treatment, particularly when it is connected to faith, plays a role in public policy regarding patient consent. In a Sydney Morning Herald article, journalist Amy Corderoy uses the Biscoe and Kidson-Gerber case to point to what she perceives as a growing area for conflict. New medical technologies that can be performed on fetuses in utero (with a patient’s consent) are colliding with a recent Australian bill that would make it a crime to harm or kill a fetus (a “pro-life” law that would thwart a patient’s consent). Operating on a fetus that has, say, a faulty heart valve should, according to established rules of patient autonomy, require a woman’s consent. But the bill would override that consent if the woman makes an informed medical decision that contradicts broader (Christian) religious ideas. Corderoy reminds us that medical advancement often challenges faith-based ideas and that new technologies can not only save lives but also change our ideas of what life is. Our assumption—and Corderoy’s—is that faith and medicine are always in conflict. But that’s not the case. Sometimes they work in tandem, sometimes one ultimately catches up with the other. Laws can then reflect what shakes out between the two. The issue of Jehovah’s Witnesses and denial of blood transfusions is held up as a worthy case study because it pushes us to consider how society and the law decide what is more important: faith or medicine. But we are entrenched, in Europe and the US, in a culture that is dominated by a form of religion that persistently fails to acknowledge the autonomy of some patients, regardless of their religion: women. In essence, Jehovah’s Witness cases are “cleaner” arguments because they can work with that religion-medicine dichotomy without getting messed up in the gender stuff that with which abortion is wrought with. Which is why the Biscoe and Kidson-Gerber case is so fascinating. It pulls in the autonomy of a pregnant woman, and sets itself up as an example of what autonomy should be. I am sure it’s not a best-practices example for many in the “pro-life” movement. Yet, as faith and ethics wrestle for jurisdiction over these vital questions, sometimes we encounter beliefs that direct medicine in new life-saving directions. In “Medicine Without Blood,” an article at The Atlantic this month, Alex Ashley examines new medical technologies that, with a push from the Jehovah’s Witness community, are pioneering ways to practice medicine without transfusions. Some methods include capture of a patient’s blood during surgery so it can be reintroduced into the patient afterward, or hemodilution, a means of extending the circulatory system to store blood outside the body until after treatment. According to the University of Pennsylvania’s Center for Bloodless Medicine and Surgery, blood-management programs help hospitals cut down on unnecessary blood draws and the amount they spend acquiring and storing blood. Blood management has also been linked to shorter patient recovery times and reduced risk of infection. In this light, the Biblical interpretations of Charles T. Russell, the founder of Jehovah’s Witnesses, appear prescient. Jehovah’s Witnesses have established a global network of Hospital Liaison Committees (HLCs) that mediate communication between patients and doctors. Ashley notes that there are some 140 HLCs in the US and their work has coincided with the recognition among hospitals and medical providers that managing blood use has broader benefits. Writing as I do so often in this column about the conflicts surrounding faith and medicine, it’s refreshing—even edifying—to see religious beliefs as the source of medical advancement. Theoretically, if blood management is adopted across the globe, a pregnant Jehovah’s Witness with a Leukemia diagnosis won’t have to die. Nor will her fetus. But medically side-stepping transfusions doesn’t resolve the issues of consent that we see in places like Australia and the United States where constant challenges are made to a patient’s autonomy because she is pregnant. These challenges don’t come from Jehovah’s Witnesses, but rather from a dominant and politicized form of Christianity that has elevated fetal life above female consent. Medical advancements have given women the ability to determine the number of children they have and when, but these new technologies can’t—or yet haven’t—convinced bishops, pastors and social conservatives that a woman is trustworthy. Ann Neumann is a contributing editor at The Revealer and Guernica magazine and a visiting scholar at The Center for Religion and Media, NYU. Neumann‘s book, The Good Death, will be published by Beacon Press in February 2016.